Over 100 different good wishes, quotes, toasts & jokes for newlyweds! Customizing Ideas: Tie gold and silver balloons to pail handle and use as a centerpiece on each table at reception or shower. Use as alternate placecards at wedding. Write guest’s name on box with their table number. Fun party favors to give guests when they leave. 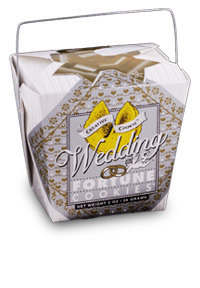 The top of the pail can be imprinted or handwritten with couple’s name and wedding date. It isn’t just a wedding. It’s the last time any of us will fit into a size 5! Give a girl enough rope and she’ll ring the wedding bell. It takes a smart husband to have the last word – and not use it. Many a poor husband was once a rich bachelor.